Electro-Harmonix has announced the Bass Blogger, a distortion pedal for bass guitar that features a dual-mode switch for changing between standard distortion and fuzz. The pedal is of the usual EHX single stompbox breed, featuring the expected volume, drive and tone controls. Interestingly, though, the Bass Blogger also contains a dry output jack - meaning the dry and distorted signals could be combined for a fuzz bass tone with no lack of sub (a common side-effect when using fuzz on the bass). Of course, you'd still need a separate mixer or splitter/combiner pedal - but it's a nice feature none the less. 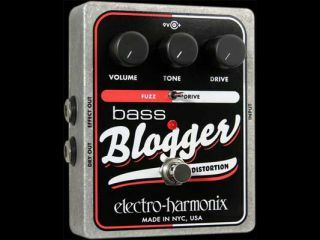 There's more information on the Bass Blogger at Electro-Harmonix's official website - and they promise a video demo soon - but no price or availability has yet been announced.